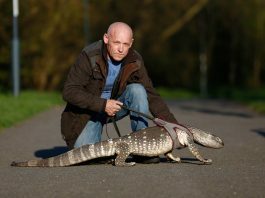 Artist Ricky Minns, 43, also known as Ruddy Muddy. 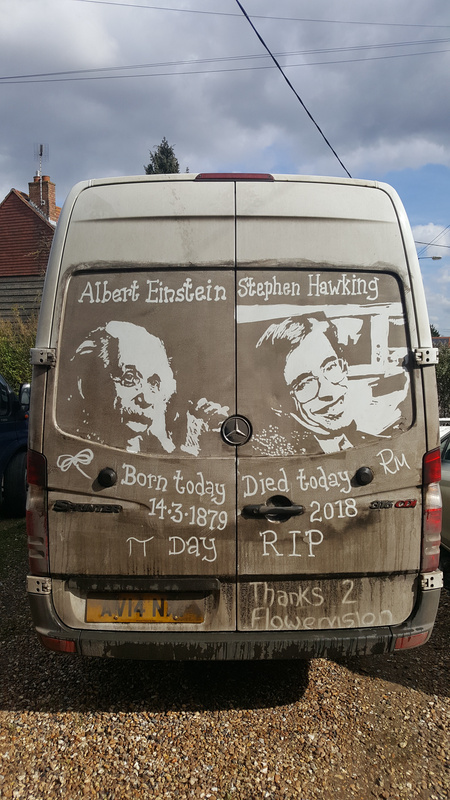 A white van man has paid tribute to the late Professor Stephen Hawking by drawing a picture of him on the back of his muddy flower delivery vehicle. 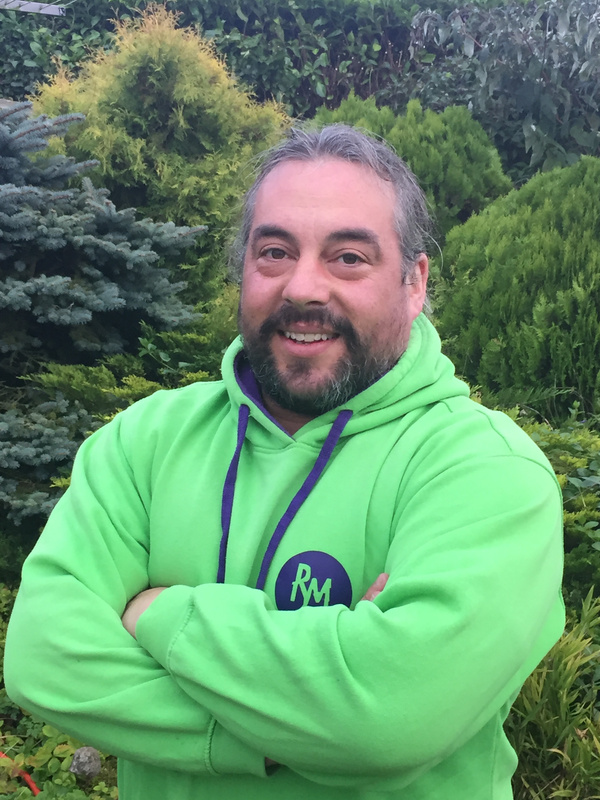 Ricky Minns, 42, who goes by the name Ruddy Muddy, spruces up vans in need of a wash by drawing works of art with his fingers. And after hearing of the death of one of the world’s most famous physicists, it seemed only fitting that he was immortalised in the unique style. However, Ricky also made reference to the strange coincidence that today (weds) is also the anniversary of Albert Einstein’s birth in 1879. It is also Pi Day which honours the ratio of a the circumference of a circle to its diameter, bringing yet another scientific link to the professor’s life. 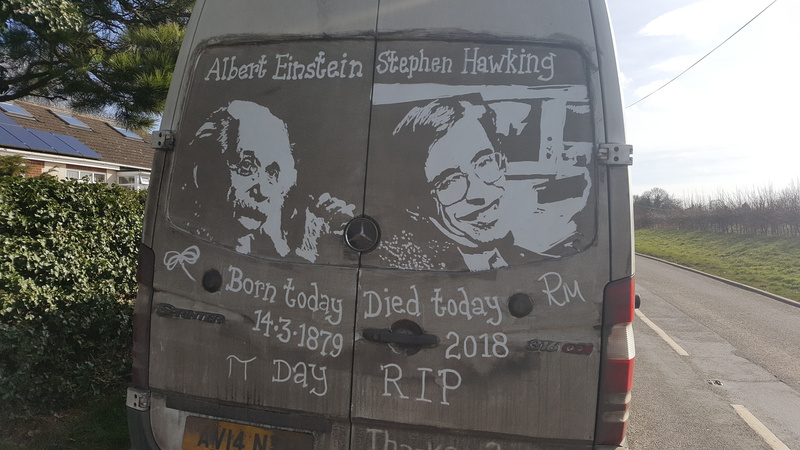 Physics graduate Ricky drew the scientific greats side-by-side on his van, writing their names and “born today 14.3.1879, died today 2018”. Other recognisable Ruddy Muddy designs are those of Prince Harry, Leonardo Di Vinci’s Mona Lisa, Prime Minster Teresa May, and Labour leader Jeremy Corbyn. Ricky has also drawn pieces of other late celebrities including Bruce Forsyth and comedian Ken Dodd earlier this week. Ricky, who is a delivery driver for a flower company, started drawing on vans eleven years ago to stop his children seeing rude words which had been etched in the dirt. He said: “It’s quite funny really, it was all because I didn’t want my kids to see the filth that people scribble on vans with their fingers. 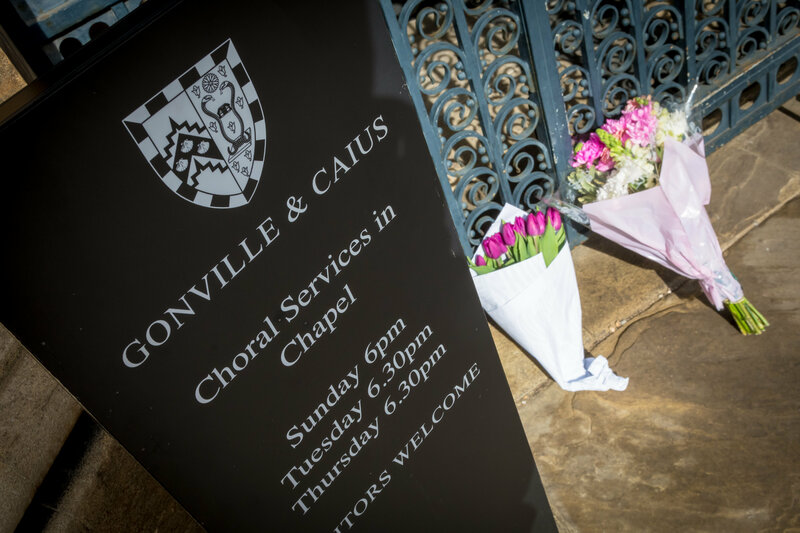 Flowers outside Gonville and Caius college, Cambridge. Ricky said that he chose to keep his initials R and M when choosing the name Ruddy Muddy, and that he signs off with this and his employers name on every piece. His technique has evolved over the years and he now sprays a secret mud recipe onto vans, but still finds his work weather dependant. He said: “The rain sort of adds a novelty to it in some ways, but my work lasts through the wet until the van is actually washed. “I actually spray the mud on with one of those garden pump things, but I can’t tell you my secret recipe of the mud itself! 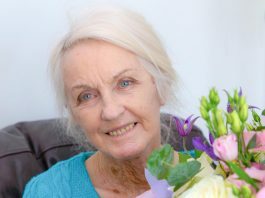 Ricky’s work has travelled from his hometown in Norwich, Norfolk, where he works for Flower Vision, all across the country. Next articleWhy is South London often overlooked when selecting a business address?